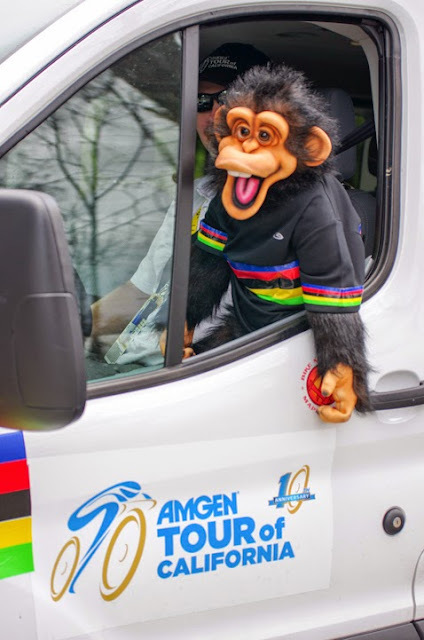 Fantastic news out of California today, the Amgen Tour of California stage race appears stronger than ever in its 11th year, as a very impressive line up of teams was announced to compete in California this May. Here is my strong tip for the day - wherever you are in mid-May, make sure it is in California. You will see some of the greatest pro riders up close with unprecedented access (and as always - great California weather). Let's get straight to naming names: 2015 winner Peter Sagan (Tinkoff) and runner-up Julian Alaphilippe (Etixx-Quick-Step) will return in 2016. Great Britian’s Mark Cavendish (Dimension Data), who won four stages last year is a huge crowd favorite and will take on Norwegian Alexander Kristoff (Katusha), who will be bring his strong sprinting ability to what might be the best sprint field to ever gather. 2012 Tour de France champion and 2014 Amgen Tour of California winner Bradley Wiggins will be back with his continental cycling team (Wiggins). Australian brothers Lachlan and Angus Morton will be back with their colorful Jelly Belly p/b Maxxis cycling team. American Peter Stetina (Trek-Segafredo) is looking forward to competing in front of hometown fans in Northern California. While Australian Rohan Dennis (BMC), a strong contender for the time trial in Folsom, could also be on a step of the final overall podium in Sacramento. Crowd favorite American Taylor Phinney (BMC) will be back in 2016. 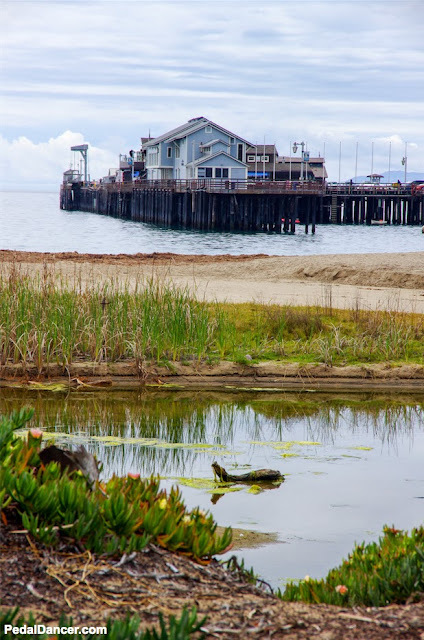 Sprinting begins on Stage 1 in San Diego, Sunday, May 15th! Make your tourist plans now. 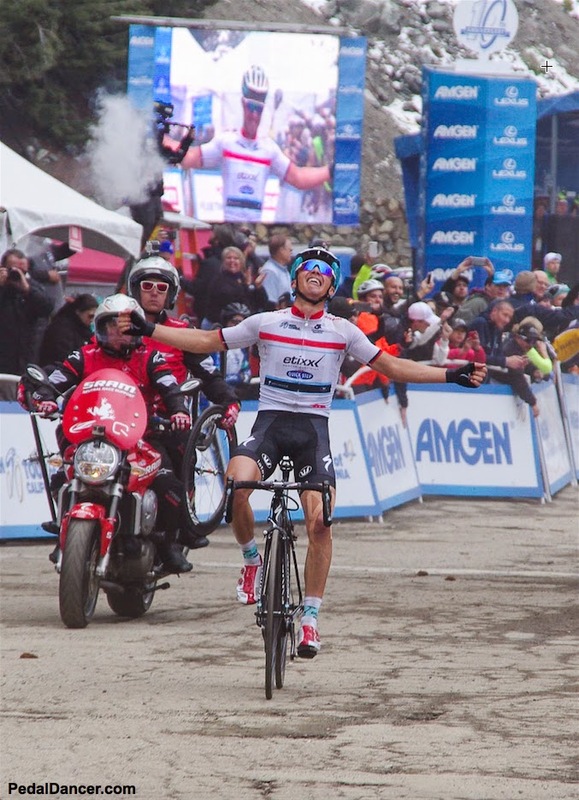 Now organized by AEG and ASO, the Amgen Tour of California stage race keeps getting better. I am especially excited about the teams of Dimension Data (formerly Mtn-Qhukbeka), Giant-Alpecin, Etixx-Quick-Step, Sky, and LottoNL returning to the race again this year. I am also excited to see first time teams Direct Énergie and Katusha. I look forward to hearing the exact rider roster announcements (startlist) in May. For certain, we will have the opportunity to watch pro riders we would otherwise have to plan a 2.5 week vacation, spend thousands of dollars and travel to Europe to see compete. The 2016 schedule should make it easy for fans to see a grouping of two or more stages by picking your area: San Diego County, Pasadena/Santa Clarita, Thousand Oaks/Santa Barbara, Monterey/Santa Rosa, Tahoe/Folsom/Sacramento. I totally agree with Peter Sagan who said, "The Amgen Tour of California is one of my favorite races of the season." Take the time to visit the team websites and check out their sponsors and the kind of gear they use. 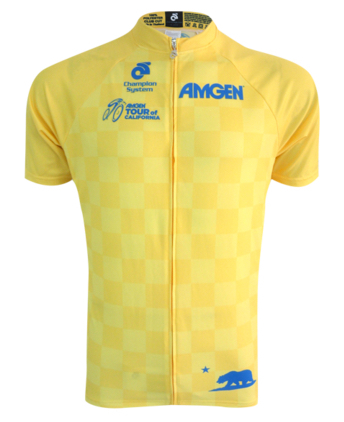 Team sponsors, great race organization and the ongoing title sponsorship by Amgen make this race a continuing success. Each team will bring a roster of 8 riders each. Rally and United Healthcare will be bringing both a men's and women's team. Their team buses and mechanic's trailers should be teaming with activity. Women's team jersey 2016 Amgen Tour of California. 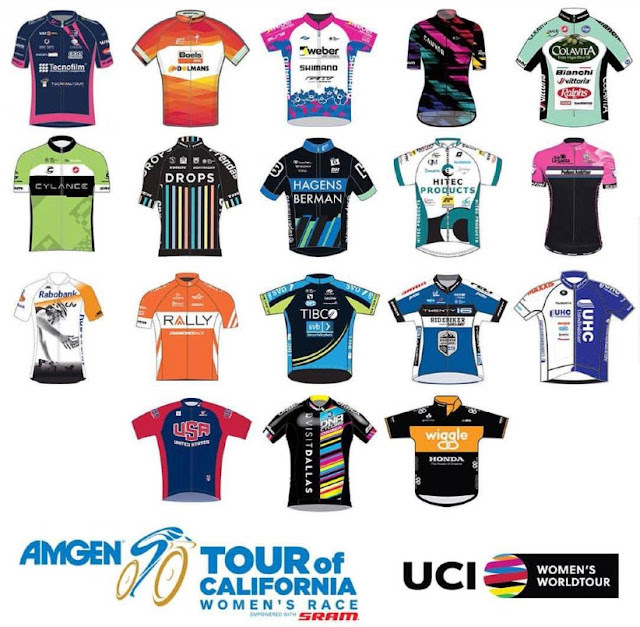 For more information about the 2016 Amgen Tour of California, with race dates, stage maps and start and finish times, please visit the Pedal Dancer® guide page at: TOUR OF CALIFORNIA 2016.